I love, love, love swimming. I’ve been a fan of Gospel Oak lido for years – it’s a stainless steel-lined 60m x 27m temple to swimming. It’s walking or cycling distance from home, so when I left work the lido – and the sport – were the obvious things to focus my day on. I’ve swum in new places and made new friends – and swimming has been a fantastic way to shed the stress of being made redundant. The photo above was take on day one – 14th May 2014. I shed the wetsuit 2 days later. This year my outdoor swimming season spanned May to November, last week I reluctantly wimped out and moved indoors. 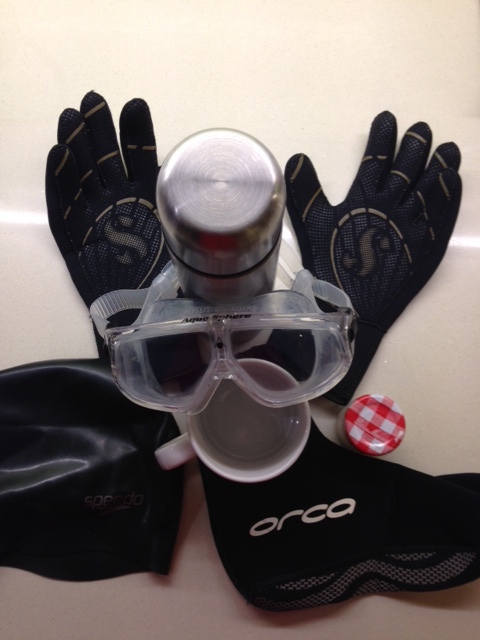 I’ve packed away my essential lido bag of wetsuit, neoprene booties and gloves, thick hat, googles, thermos and tea kit. When the water temperature – it’s unheated – dips below 10’C I find I can’t swim for long or far enough for it to count as proper exercise. 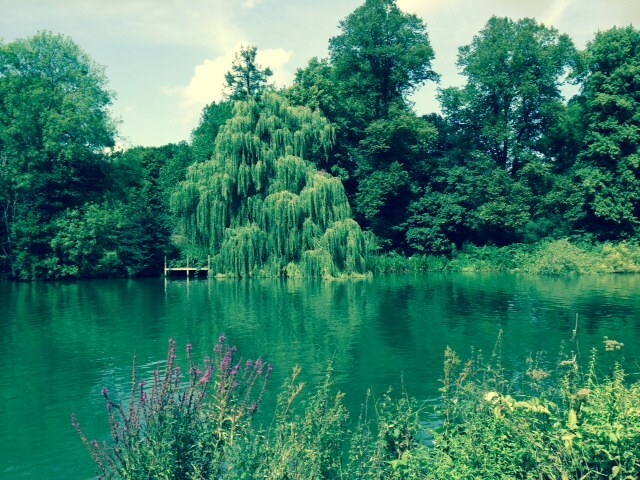 I’ve swum elsewhere too, and here are my top 5 outdoor swims of the season. I’d love to know yours as well! Another time I’ll dip into my favourite swimming books. I really used my membership to its max this summer – with 21 swims in June alone. The water temp maxed out at 24’C when the air was 29’C – it might have gone higher later but by that stage you can’t see the water let alone find space to spread a towel to sit on. 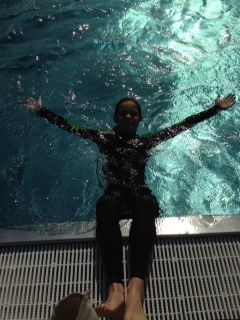 Our ten year old twin daughter loves the water as much as me. She has grace, speed and superb technique – I don’t. My best swim of the year was without a doubt matching her stroke for stroke as we ploughed up and down side by side in September, her in a brand new long-sleeved wetsuit me just in my swimsuit. 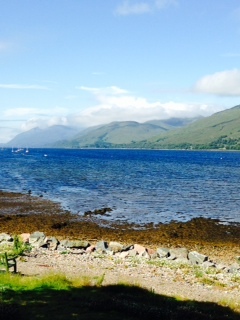 I arrived in Fort William one July morning via the sleeper train from London Euston. With 2 hours to kill before the Fort William to Mallaig train departed what could I do? I took a wander along the shores of the loch. 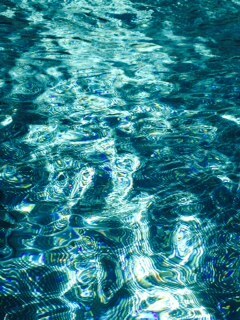 How inviting the water looked; crystal clear and fresh. Did I have a towel on me? No. Did I have my costume? Yes. What was stopping me from having a quick dip? Nothing. So in I went, for my first Scottish swim of the decade. Bliss. I spent 2 nights with a friend on the Isle of Eigg. We stayed in a B&B www.lageorna.co.uk run by the extremely good cook, and very hospitable Sue Kirk, half a mile from a beautiful beach. 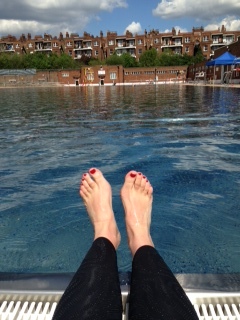 I swam before breakfast and supper – and if I could’ve swum more I would have. The water was warm, almost balmy, thanks to the Gulf Stream. 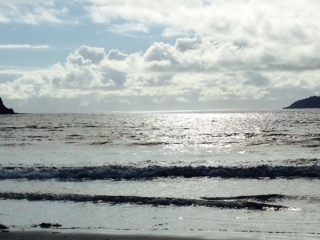 The sun was so slow to set and cast a silvery spell over the water. On my last evening swim I went back in three times, loath to leave its magic. Three adults, four children and one enthusiastic black Labrador got the urge to swim. So off we went, OS map in hand, to find the perfect spot. We tentatively waded in and swam back and forth across the balmy water, chatting to various boat owners or captains who invariably raised their glasses and told us we were mad. Such fun, and a real highlight of our summer. I’m not revealing the exact location of this beach, but it’s near Sewerby which is a couple of miles from Bridlington. Fine golden sand is exposed at low tide, whilst at high tide you step over milky white pieces of chalky rock. The water has always been calm in August, and you swim out to the headland then dash back in time to pick up fish and chips. Perfect. Next > Applying for a job: acceptance or rejection, negative or positive outcome? What a gorgeous post Clare! As a fellow swimming enthusiast, I feel inspired to try some of these spots, and more, out. Do write a post about swimming books, I just read Lewis Pugh’s ‘Achieving the Impossible’ – a fab read! Thanks Georgia. I’m intrigued by Lewis Pugh, with your nudge I’ve just looked up his other book too, ’21 Yaks and a Speedo’. What a great title eh, and the reviews on amazon are all good – love the fact someone’s recommended reading with a pack of post-its to hand. I read a lot of management / leadership books last year, the stand out one for me was Olympic gold medallist Ben Hunt-Davis’s ‘Will it Make the Boat Go Faster?’ Definitely worthy of anyone’s Christmas present list.